Texans grew 7,900 tons of commercial peaches in 2008 according to the USDA, and many homeowners try their hand at growing peach trees in their yard. Who can blame them? Fresh peaches smell wonderful and taste even better. Homemade peach ice cream highlights many summer picnics. However, as with all Texas fruit trees, peaches require regular care to limit insect and disease damage. In addition, peach trees in the open are vulnerable to late frosts and spring hailstorms. Select a site that is higher than its surroundings, if possible, to limit frost damage. The site also needs to have good drainage, full sun and access to water. 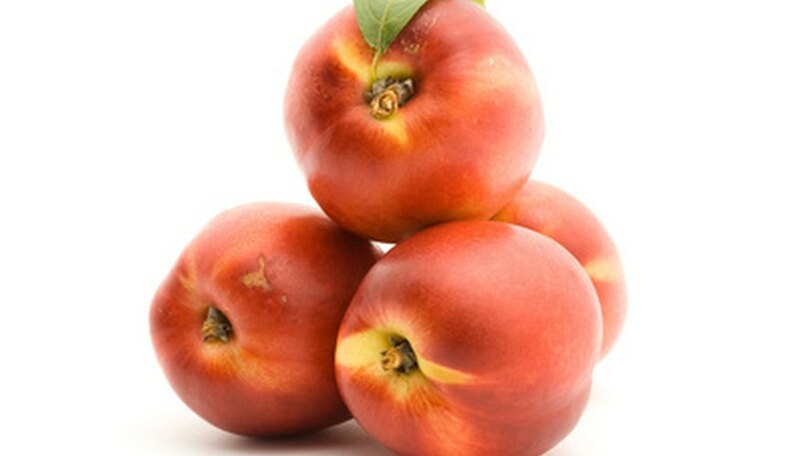 Peaches prefer sandy loam soil that is 18 to 24 inches deep. Although peaches grow well in the alkaline to p.H. neutral soils of North Central Texas, they prefer soil that is slightly acidic, like the soil in East Texas. Get a soil test from Texas A&M Soil Test Laboratory or a local soil testing lab. Request the lab test for micronutrients and salinity in addition to the routine tests. If using groundwater or aquifer irrigation, have the water tested for salts by the same lab. Texas sites with total salts above 1,000 parts per million are not suitable for growing peaches. Clear the site of plant materials and debris and till the top layer of soil. Add the soil amendments recommended in the soil test report. Contact the Texas Excavation Safety System before digging a tree-planting hole to have the utility companies visit the site and mark the locations of their lines. Select peach tree varieties that have a chill time requirement that matches your Texas area’s chill times. The Texas Panhandle experiences 900 to 1,000 hours of winter temperature, which is defined as between 32 degrees and 45 degrees Fahrenheit, while the Gulf Coast has 200 to 400 hours. Purchase peach trees for planting in December through March. Dig a hole three times as wide and as deep as the tree’s container. Center the peach tree in the hole and backfill with soil to half fill the hole. Tamp down the soil to firm and remove air pockets. Water thoroughly. Fill the hole with backfill soil until level with the ground surface. Press firmly to remove air pockets, and water thoroughly. Prune the tree to 24 to 36 inches tall, and remove lateral branches flush with the peach tree trunk. Wrap the lower 18 inches of the peach tree with a growth tube or aluminum foil to protect the trunk from sunscald. This protection can be removed after the tree is established in its second year. With good care in the first year, your Texas peach tree should produce fruit in its third year. The Texas A&M University "Peach Production in Texas" offers suggestions on varieties with their chill time requirements by region. Follow the fruit tree spray schedule suggested by Texas A&M University. Do not plant peach trees near power lines or other utility lines, including gas, phone or water lines.